Assembling this delicious breakfast at night allows you more time to enjoy it on a busy morning, even if you must take it to-go. This recipe is great for peanut butter lovers, as it is positively exploding with America’s favorite sandwich spread thanks to both crunchy peanut butter and salty chopped peanuts. Topped off with banana slices, cacao nibs and chia seeds, this oat breakfast is packed with protein and tons of flavor. Even if you have more time for a leisurely morning meal, you just might want to make this recipe part of your everyday routine! Using a resealable container means that even if you are short on time, you can quickly add the toppings the next morning, reseal, and take your oatmeal along with you to enjoy later. Use dark brown sugar or maple syrup if you do not have coconut sugar. Make this gluten-free by using gluten-free oats! Per Serving: 662 calories; 35g fat; 71.5g carbohydrates; 24g protein; 10mg cholesterol; 421mg sodium. The best peanut butter oats recipe! Ok, I'll admit, you had me at peanut butter. I'm not really even an oatmeal kind of girl, but I loved this recipe. I added extra cacao nibs, because can you ever really use enough? So easy and so delicious. These are my favorite peanut butter overnight oats! Rarely do I have time to make breakfast in the morning so these are perfect for on the go. If you'e never tried overnight oats, this is a great recipe to start with. 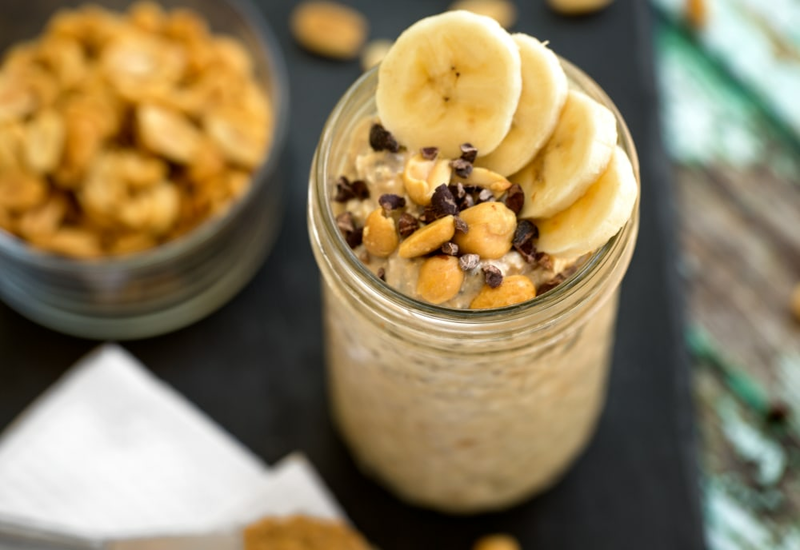 These peanut butter and banana overnight oats are really good. I made this the night before using a mason jar and carried it to work with me the next day. Using crunchy peanut butter makes all the difference, and I definitely prefer it to the creamy peanut butter. Yum!